Select one of the above links to be taken to the information on this page. Alternatively, for more information for our business customers. The first thing you will need to do to access your account is login. You can do this by going to our e-learning candidate log-in page. Simply input your username and password (usually supplied in the welcome email) in the text boxes in the ‘Candidate Login’ section. If you do not receive a welcome email, please contact us. Once you have successfully logged in to your account you will see this screen (screenshot below). By default you will land on the ‘Your Courses’ tab. This section will list courses that you have full access to. 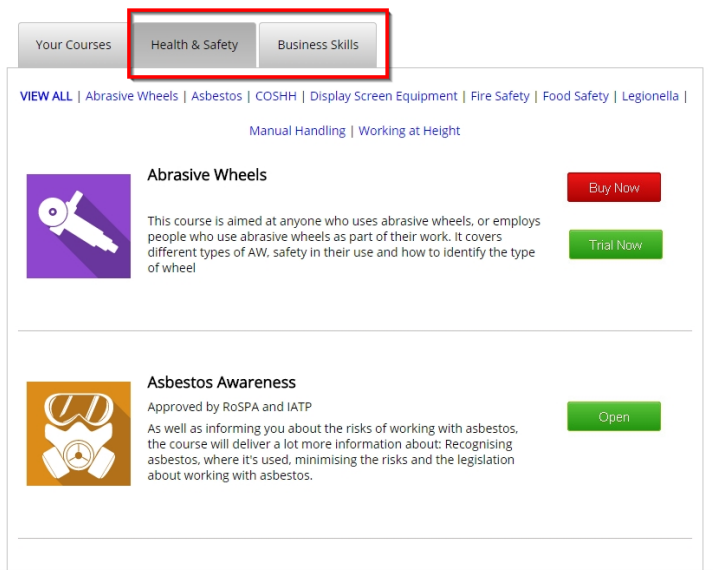 To start a course click the ‘Open’ button on the right of the course description. Once you have opened a course you will be presented with a welcome video. The courses are module based and each module has a series of videos with questions at the end. There is a pass percentage for each module that will have to be achieved on every module to complete the course and access your certificate. Note: you get 3 chances to achieve the pass percentage on each module. If you fail a module more than 3 times you will have to contact us to arrange a reset. A maximum of 3 resets are allowed per course before it is permanently locked and you would have to purchase the course again. Once you have successful completed a course you will be presented with a ‘Get Your Certificate’ button. Use this to download your certificate in PDF format. 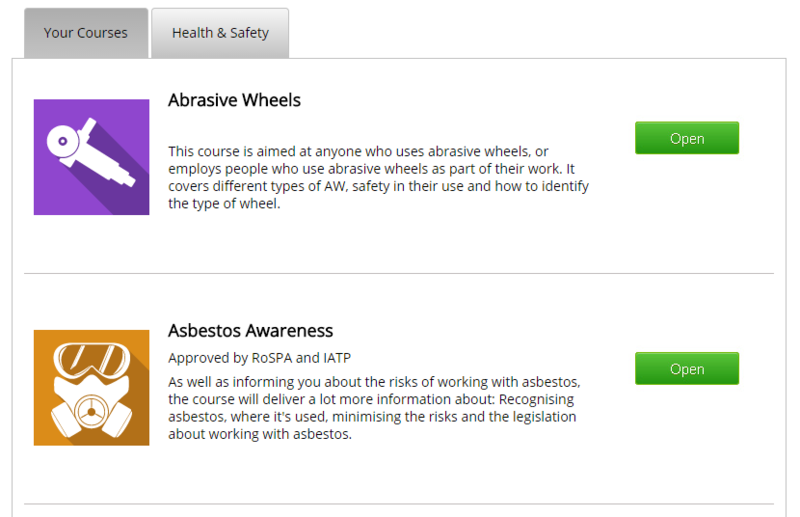 To purchase another course use the tabs highlighted in the screenshot below and click the ‘Buy Now’ button. Note: only one licence per course can be associated with an individual account. If you would like multiple licences for a single course then please contact us to arrange for a business (multi user) account. Why can’t I login to my account? Please ensure you are logging in under the ‘Candidate Login’ section and that you are copying and pasting your username and password directly from the welcome email into the relevant text boxes. If you are still having issues logging in then please contact us, and we will get back to you in one working day. Why can’t I see any course videos? Some of the courses require Adobe Flash Player to be enabled in your web browser. It isn’t my name on the account. How can I change this? If your course has been purchased by someone else and isn’t associated with your name then please log out immediately and contact us for a name change. Note: This must be done before you have completed the course and accessed your certificate. Why are the course videos buffering? It is likely that this is a problem with your network speed. The courses require a 3Mb download speed to run smoothly. If multiple users are accessing courses on a single connection it can cause slowdown. If you are having buffering issues you can turn off the ‘High Quality Video’ setting at the bottom-right of the video player on the module selection page to help improve performance. Why can’t I take the course on my mobile device? The content has been tested and is known to work on iOS devices from the iPad 2 onwards and iPhone 4 onwards. It has also been tested on some Android devices including the Samsung Galaxy tab II and the Kindle Fire HD. Beyond this it should work on most other Android devices but there may be some exceptions depending on OS version and browser used. Note: For the best experience we always recommend you complete the course using a desktop or laptop computer. Most modern browsers will have the necessary plugins to run the course content already built in. If you are not able to see the content please make sure your web browser is up to date. The video content shown in this course has been optimised to run at quite low speeds but it still needs a stable broadband connection to run smoothly. The minimum download speed we would recommend is needed to run the course in its standard quality is around 3 mbps. The High quality videos are intended for use on higher speed connections and should work best at speeds of 5mbps or higher. There are other factors that can affect the performance of the video content shown throughout the course. These can range from low spec machines, which is why we have our minimum system requirements published below, to intermittent connection issues between your location and your ISP. The speed test tool is intended to give you an idea of whether a low connection speed could be the cause of your problems but does not give the full picture. If you have a problem with a specific video but others seem to be working fine it may be that the original download of the file you are trying to view was interrupted and the incomplete file has been cached by your web browser. This issue is usually solved by clearing your web browsers cache. To find out how to clear the cache in your particular browser. Please visit the web page and follow the link that relates to your web browser. Please ensure your speakers or headphones are plugged in and turned on. If this is the case please ensure that the computers audio is turned up to reasonable level. If you don’t have access to speakers or work in a busy office we would recommend using headphones. If you are still having problems after working through these steps please contact us directly.